This beaded necklace is a contrast in shades and textures. Beautifully angled and faceted West German glass pieces were made in the late 1940s. They're a warm amber-brown, and I've paired them with vintage Swarovski tapered round crystal beads in a lighter shade of the same color. 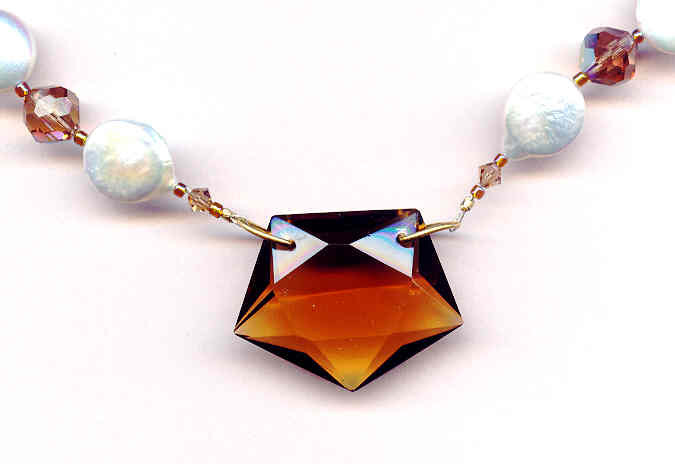 Both the white coin pearls and amber brown seed beads are iridescent to the max. The 18-1/2" beaded necklace closes with a dainty gold fill hook set. 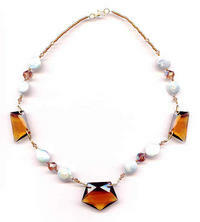 It's another spectacular beaded necklace from SPARKLE PLENTY. The angular Colorado topaz glass pieces have long straight facets typical of art deco design. The spectacular foil-core lampwork discs were made in Japan in the early 1950s. The deep brown gloves are vintage, but have never been worn.